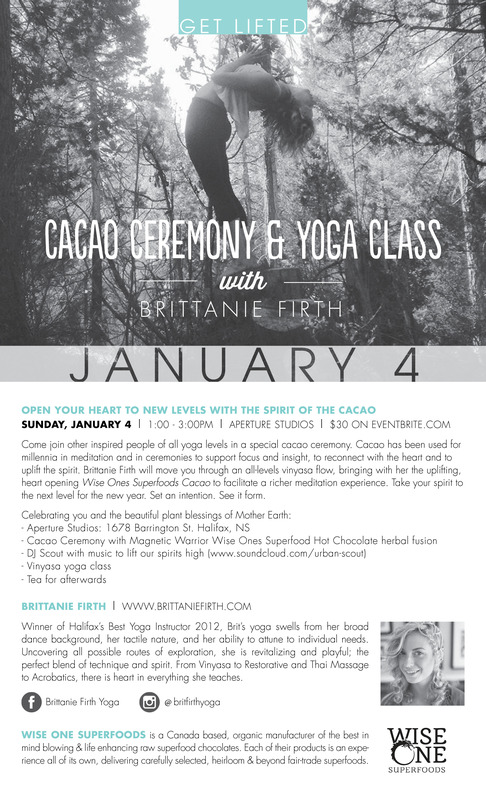 Come join other inspired people of all yoga levels in a special cacao ceremony. Cacao has been used for millenia in meditation and in ceremonies to support focus and insight, to reconnect with the heart and the uplift the spirit. Brittanie Firth will move you through an all-levels vinyasa flow, bringing with her the uplifting heart-opening Wise Ones Superfoods Cacao to facilitate a richer meditation experience. Take your spirit to the next level for the new year. Set an Intention. See it form. Location is Aperture Studios on Barrington. Bring a Mat, warm layers, water, and a tea cup for after. If you journal feel free to bring something to write with. Get Lifted for the New year and new you. Wise One Superfoods is a Canada based, organic manufacturer of the best in mind blowing and life enhancing raw superfood chocolates. Each of our products is an experience all of its own, delivering carefully selected, heirloom and beyond fair-trade superfoods. We’re Levity Inspired, designing our chocolate to elevate the senses and uplift the spirit! Brit’s yoga swells from her broad dance background, her tactile nature, and her ability to attune to individual needs. Uncovering all possible routes of exploration, she is revitalizing and playful; the perfect blend of technique and spirit. Winner of Halifax’s Best Yoga Instructor 2012 before moving to Vancouver, BC. She has taught in nearly every province in Canada. There is heart in everything she teaches. From Vinyasa, to Restorative, and Thai Massage to Acrobatics, there is heart in everything she teaches.